Also see Entry Requirements below. Learn to write for film, television and radio through highly practice-based mix of modules. Regular feedback provided by accomplished industry professionals. Write a ‘calling card’ feature-length script or TV pilot in the third year – a rare opportunity at undergraduate level. Receive an industry script reader’s report from Industrial Scripts on your final year feature film script or TV pilot – for more details see Year 3 Final Project module below. Benefit from small class sizes and exceptional tutor support. Course patron is the award-winning film and TV producer David Thompson. Our Screenwriting degree is a fantastic pathway to an exciting career in an ever-evolving industry. During your degree you acquire the traditional skills associated with writing for film and television, and how these skills can be transferred to digital platforms. We also give you the skills to write for features films – a rare opportunity among undergraduate courses. Designed to mirror industry standard script development, our course offers many opportunities to write and evaluate screenplays by producing documents such as step-outlines, treatments, screenplays, premises, synopses and script reports. Our small workshops provide you with the chance to get insightful feedback on your scripts at least every three weeks, and at certain points in the degree on a weekly basis. You will also be regularly pitching to fellow students in class, giving everyone the chance to offer their own perspective on your work. Join our course, we will do our best to make sure you graduate with ‘industry-ready’ confidence, and a portfolio of writing that is diverse and polished. In your first year, you are introduced to both practical and critical approaches to their work. You explore connections between theory and practice and are encouraged to start and develop their professional portfolio. During year two, you further develop critical and analytical skills and your conceptual creativity and storytelling abilities, resulting in the creation of a diverse range of scripts, essays and even digital film material. In the final year, there is a stronger focus on negotiated elements of work including a critical dissertation and an independent screenwriting project where you write a 60-120 page feature, television pilot and series outline, or a portfolio of shorter screenplays. Below us an overview of course modules, and more details are available here. This introductory module is designed to stimulate students' intellectual curiosity. It will develop students' critical knowledge and skills base in ways which complement and inform the conceptual and practical work being done in other Level 4 modules. The module introduces Film Studies as an academic discipline, provides students with a toolkit of concepts for close analysis of a range of film texts and genres, links concepts to longstanding issues in film criticism and theory, and sets students on the path of historical and contextual film enquiry through the study of a diverse range of films. This module introduces students to the importance of character development and its centrality within the screenwriting process as a whole. While links are made to the importance of narrative structure, students will focus on how story can be developed through character rather than plotting. Thus, this module complements and supports the concurrent work in Developing Screen Ideas, which is more focussed on narrative structure and industry. This module introduces students to the developmental process in the film industry and is fundamentally concerned with the generation of ideas and the creative processes involved in their realisation. This introductory module is coupled with and follows directly on from Film Studies One. The module is designed to stimulate students’ intellectual curiosity in the field of Film Studies. It develops students’ critical knowledge and skills base in ways which complement and inform the conceptual and practical work being done in Video Practice and Production: Introduction, as well as students’ work in the other Level 4 modules. Throughout the semester students develop their knowledge and understanding of how genres evolve, and the debates surrounding the classification of genres. Students develop in-depth knowledge of three to four key genres in film, and the codes and conventions associated with them through the critical analysis of a number of feature-length produced scripts. The genres studied may include, for example, horror, thriller, romantic-comedy, western, or science fiction. This module introduces students to writing drama for television and radio. It is designed to build on students’ knowledge of character development and story structure and design gained from the Creating Memorable Characters and Developing Screen Ideas modules. This module explores how literary texts can be adapted for the screen. Students consider filmic rewritings of major literary forms including drama, the novel and short fiction and engage in the debate about the ‘fidelity’ of adaptation. The module combines a theoretical approach to the study of adaptation with contextual approaches to specific films, presented as case studies. This module uses the introductory knowledge of writing television drama from level four, and theoretical knowledge students gained in the autumn semester in Television: Contextual and Critical Studies as a foundation for students to develop their own ideas and scripts within the medium of television. This module builds on students’ knowledge of critical textual studies from the first year modules Film Studies One: Analysis and Issues and Film Studies Two: Film History, and serves to introduce students to the critical study of television. This module explores the theory and practice of writing for the screen, specifically the 10-minute short. Students engage with key practical manuals and critical studies of the screenwriting process and study a range of globally diverse shorts. The culmination of this work is the production of a 10-page screenplay, which is filmed by the Digital Film Production students in semester two. This Level 5 module is designed to continue the focus on textual and contextual study and the development of subject-specific and generic skills established especially in Level 4 Film Studies: Analysis, Issues and History. As with the Film Studies module, it develops students’ critical knowledge and skills base in ways which complement and inform the conceptual and practical work being done in the Level 5 Video Practice and Production: Documentary and Drama. This module consolidates knowledge and skills relating to form, structure, style, character, genre, setting and visual writing, which students have acquired in previous screenwriting modules, and ensures they are able to understand and use concepts they may have yet to use in quite so much detail such as subtext, dramatic irony and theme. This year-long module represents the culmination of students’ critical development on the course. It provides an opportunity for students to explore a chosen area of Film studies. Students design and carry out a sustained and coherent piece of independent research in an area of scholarship that they wish to pursue. This module builds on students’ knowledge of the development, story design and outlining processes in screenwriting and is fundamentally concerned with the generation of ideas and the creative and practical processes involved in their realisation. Students develop ideas for a feature film. In intensive weekly workshop and feedback sessions students submit development documents such as premises, outlines, treatments, step-outlines, synopses and draft script pages for critique by their peers and module tutor. This module uses the summative work from the Development and Story Design: Final Project module as a point of departure, and represents the culmination of students’ creative and self-reflexive development in screenwriting. It provides an opportunity for students to write the original feature-length film script or TV pilot and series they developed during the autumn semester. Students receive notes and feedback from their tutor on their first and second drafts, and then for their third draft they receive an industry script reader’s report, which is provided by Industrial Scripts. Founded in 2010 by a Warner Bros and Paramount Pictures script consultant, Industrial Scripts is now one of the world’s leading script development companies. The company is unique in its sector, having been reviewed over 1,000 times on Google-recognised independent reviews sites. On completion, students will have an extended piece of work, which can be used as a ‘calling card’ script. This module will provide an opportunity for students to research progression routes into a career in screenwriting and / or related fields where they could transfer their skills, and will also develop the knowledge and skills that underpin their own creative, professional and personal self-development. Building upon level four and five practical screenwriting modules, this module prepares students for professional life after graduation and establishes the skills and resources needed to develop a sustainable practice and work in either a self-employed or employed capacity. 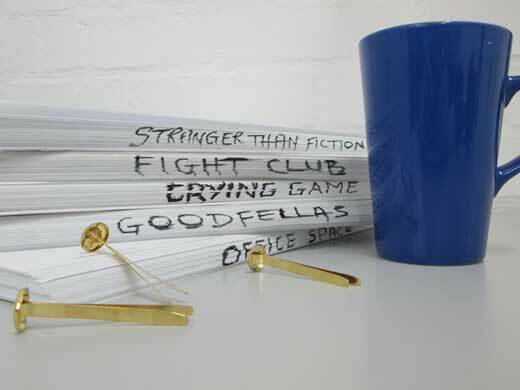 With the evolution of digital technology, there has been a shift in the definition of screenwriting. Since we now live in a primarily visual culture, narratives and content are in great demand across a variety of platforms. Where screenwriting was once niche to cinema and television, it is now sought after by a diversity of employers. From webisodes and online games to content marketing, advertising and digital corporate communication, this progress is opening up opportunities for graduates with the right skills. The skills you learn are also highly transferable, serving as a springboard into a variety of roles – from Screenwriter, Script Researcher, Script Editor and Storyliner to Producer, Advertising Account Executive, Market Researcher, Teacher, Cinema Manager or Film Critic. Here's a helpful list of more careers in the industry that you may choose to pursue. Your portfolio is your opportunity to shine in an interview: it is your chance to show us what inspires and excites you. We encourage you to include any visual and written work in your portfolio that will show your creativity and skills in visual communication. Presentation - whilst presentation is important, it is the work itself that is going to be judged. Concentrate on the content! What is relevant: does your work match the course you’re applying for? As well as our superb teaching team, which includes specialists in screenwriting and filmmaking, we offer an inspiring learning environment. Based in the Waterfront Building, overlooking the marina in Ipswich, you have stunning surroundings that serve as inspiration and the lively social scene where lifelong friendships are made. Working with the Digital Film degree students, your work will be produced using our range of industry-standard equipment and software as well as our large multipurpose production studio. Suffolk is renowned for its exceptional cultural events such as Aldeburgh DocFest, which has attracted famous names such as Bill Nighy, Joanna Lumley, Louis Theroux and John Sergeant. Every July Latitude Festival offers the opportunity to see documentaries, discussions and debut screenings.